As I write there’s plenty of blooming going on in our garden – heartening in view of the stresses imposed on our rhododendrons, in common with many other plants, by the continuing dry conditions and especially by the very hot, dry summers of the last several years in most parts of southern Australia (in Melbourne last summer we experienced the highest temperature ever recorded, and disastrous bushfires in our region). Spring still lifts the spirits. Vireyas and azaleas, arboreums and hybrids derived from them, decorum, cilicalyx, spinuliferum, ‘Crossbill’, and other favourites such as ‘Emasculum’, ‘Seta’ and ‘Cubittii Ashcombe’ blooming happily almost make up for the numerous recent losses. But amongst others which haven’t survived, we do miss the massed yellow blooms of ‘Chrysomanicum’ and the perfect yellow-throated white blooms of Tyermanii (as well as their attractive foliage and beautiful, peeling, colourful bark) which used to occupy featured spots. 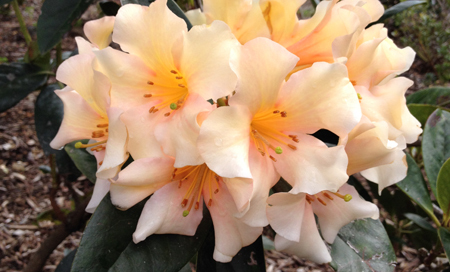 Spring also brings each new issue of The Rhododendron. We hope you enjoy this one. In feature articles Lyn Craven writes on the subject of the many different characters of rhododendron bark, and makes a case for greater attention being paid to this in taxanomic work; Andrew Rouse contributes another of his expert discussions on vireya species – this time R jasminiflorum ssp. huesseri; we are privileged to include a fascinating article on rhododendrons of Sikkim authored by Hemant K. Badola and Bharat K. Pradhan – experts who have both a professional and personal interest in them and their welfare, as well as the long-term future of the marvellous natural environment which they inhabit; Barry Davidson provides a vivid description of plant-hunting experiences on recent trips to New Guinea and Malaysian Borneo, and discusses background on the geographical occurrence of vireyas and other taxa through the region; and we carry a whimsical piece about ‘Azaleas and the law’ by Bede Haines – a recently-joined member resident in Sydney who developed a love for them. We thank all our contributors.